The Other Glass Ceiling: The Toilet Seat Problem – Solved! I see a GREAT opportunity here for someone to invent a Bi-sexual toilet seat system. What a relief! The tissue is, sorry, 'issue' is who wipes who's arse? or could that be done via technology...as well? To be fair and considerate, if men can remember to put the toilet seat down, women should remember to put the toilet seat up. The toilet seat "issue" is symbolic of kind of piddling [p.i.] things that women get upset about. As usual, only such highly privileged people are undone by such trivial matters. 1) Personally: I'm pregnant, and I pee about five times as often as he does, which really throws the %up usage. 2) This one's more general, and I know others would disagree which is why I'm posting anonymously :) When women go to the toilet, we don't necessarily have to touch anything. Toilet paper acts as a barrier between our hands and ourselves and any grossness, and the vast majority of the time our hands don't get dirtied in the slightest. At home, we often don't feel the need to wash our hands. 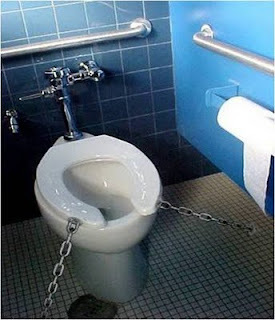 However, if we have to touch the toilet seat, it becomes a different story. When men go to the toilet it's a much more hands on experience, and they should wash their hands each and every time. Touching the toilet seat doesn't change this. So there, I said it: I'm annoyed about the toilet seat issue because, as a woman, I think it's gross to touch the toilet seat and inefficient because most of the time I don't need to wash my hands anyway. You most certainly have little idea how much you really* are getting on your hands. "Toilet paper acts as a barrier between our hands and ourselves and any grossness." I sure hope you wash after going number 2, and if so, it's not clear to me why the same principle doesn't apply to going number 1. Pee and poo are both pretty gross. Also, you ladies would be surprised at how often we men don't touch anything when we go number 1. Just pull your fly open and let it fall out I say. Sure, our accuracy is compromised a bit, but it allows us to drink a beer and read the sports page at the same time - and yes, men can indeed multi-task given the right motivation. In Asia the toilet seat (where there is one) is always up as the women don't trust the men to aim properly, and since no one wants to sit on pee so it's in the women's best interest. Yep, and it's great for the calf and hamstring muscles too!